In this video, we'll be looking at how to deflate and pack away an inflatable bouncy castle combi. 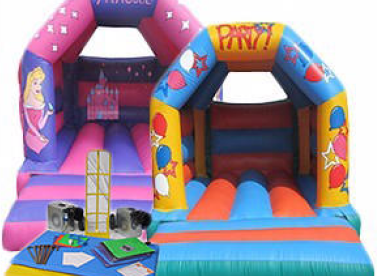 A bouncc castle combi is similar to a regular bouncy castle, but with the addition of a slide, generally mounted on the front or side of the inflatable. The principle is similar to packing away a regular bouncy castle. Unplug the fan from the power source and disconnect the funnel. Place the funnel on top of the fan and untie the deflation tube to help the air out. Ensure both the funnel and deflation tube are straight and are dispensing trapped airflow. After a few minutes the bouncy castle should be deflated. Tread any excess air towards the deflation tube. Fold the back wall in towards the centre. Fold the side walls into the middle. Pull and straighten the slide out, before folding as far in as you can. Go to each side and fold the bottom seams into the middle. Fold both sides in towards the centre again, then tread out any excess air. Go to the step (front), and start rolling, keep it as small as possible. If you have someone else to help, have them tread excess air as you roll. when you get to the end, fold the funnel and deflation tube into the roll (never leave them out).